Crickets and mealworms and pig blood in your ice cream? Salt & Straw isn't kidding around. When it came to Halloween flavors this year, the Portland ice cream maker went all out with the tricks and the treats. Their new October Spooktacular series — available by the scoop, flight or pint at all Salt & Straw scoop shops through Nov. 1 — is a total scream. And, like always with Salt & Straw, they're just plain fun. 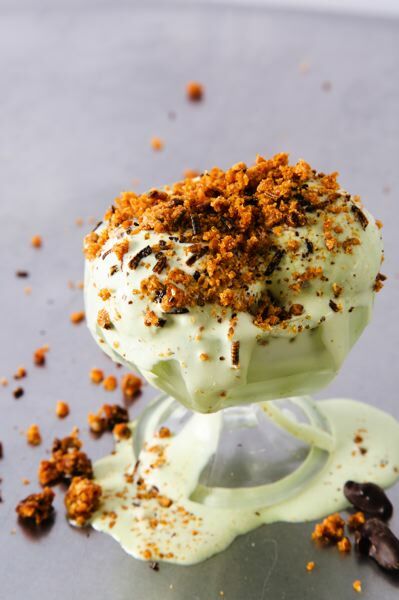 The "Creepy Crawly Critters" flavor features dark chocolate-covered crickets and coconut toffee-brittle mealworms from an Oakland, Calif., company called Don Bugito, embedded in a "green-grass" ice cream, because — you know, that's where bugs live. Sweet tooths will love "The Great Candycopia," a salted butterscotch ice cream mixed with chunks of homemade Snickers, Twix chunks, Heath bars and peanut butter cups. Just like your loot bag fell into a batch of decadent ice cream. On "Dracula's Blood Pudding," there's one ingredient that stands out, and makes us take pause. The pig's blood comes from Portland meat distributor Nicky USA, which produced a blood pudding that Salt & Straw mad scientist Tyler Malek spun with warm spices and cream in his Frankenstein-esque ice cream laboratory. Any sherbet fans out there? This one's far from rainbow — it's "Essence of Ghost," with jets of gray and white that are all at once bitter, sweet and slightly smoky. Not to leave anyone out, there is a vegan flavor that is a twist on the fall comfort beverage, the pumpkin spice latte. "Mummy's Pumpkin Spiced Potion" is made with a tea base from August Uncommon Tea in Los Angeles. It's their dried pumpkin Psychocandy tea (a dark, sweet rooibos with pumpkin and caramel), with coconut cream and candied pumpkin bits for crunch. While the scoop shop produces outrageous seasonal flavors year-round, this one was especially fun to create, the kitchen team says, because it forced them to ask questions like "What if Dracula's family passed down recipes from undead generation to undead generation?" or "What do ghosts taste like?" and "If you could make your most nostalgic Halloween candy into an ice cream, what would it be?" The family scoop shop started in Portland in 2011 and now has five Oregon locations (Division, Alberta, Northwest 23rd, Lake Oswego and Old Town's Wiz Bang Bar) and is now a West Coast phenomenon, also in Los Angeles, San Francisco, San Diego and Seattle.